Nestlé Nigeria, a leading Nutrition, Health and Wellness company collaborated with Chefs Gathering Nigeria, a professional organisation associated with the World Association of Chefs Societies, to organise a Kids Healthy Cooking Workshop. The event marked World Chefs Day, which theme this year is Healthy Kids – Healthy Future. This forms part of a global partnership between Nestlé and the World Association of Chefs Societies to promote healthy diet and lifestyle. 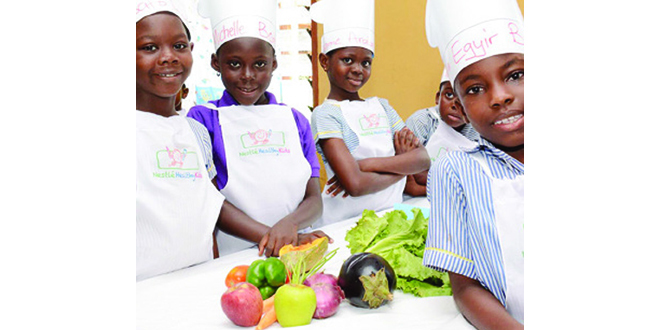 The cooking workshop took place at the Ilupeju Primary School, one of the Nestlé Healthy Kids schools in Nigeria. The Nestlé Healthy Kids programme is a global programme that promotes nutrition education and physical activity among school children. The programme is being implemented in Nigeria since 2011 in partnership with the State Universal Basic Education Board (SUBEB) and Centre for Health Education, Population and Nutrition (CHEPON), a non-governmental organisation. To date it has reached over 62,000 children in 112 schools in Lagos, Ogun, Oyo and Ondo States. As part of the day’s event, the President of Chefs Gathering Nigeria, Mark Punshak, shared his professional experience as a Chef with the children and helped them cook vegetable fried rice with mixed vegetable sauce from locally grown and affordable vegetables. Speaking at the event, Nestlé Nigeria Managing Director and Chief Executive, Chief Dharnesh Gordhon remarked “Nestlé believes that healthy eating habits should begin from childhood and we are committed to empowering children to make healthy dietary decisions through the Healthy Kids programme. Chef Mark Punshak stated that “Cooking and having the pleasure to cook are important part of nutrition education. Nestlé and Chefs Gathering Nigeria share the same ambition to raise awareness of healthier lifestyles and healthy cooking among school-age children”. At the end of the lesson, the children sent home recipe cards for their parents encouraging them to ensure a healthy nutrition and diet for them at home and at school. Nestlé Professional, Nestlé’s business that supplies the food service out-of-home industry, works closely with chefs associations in the hospitality and food industry to promote healthy meal options for consumers. This story was published in Newswatch Times on October 22, 2015.